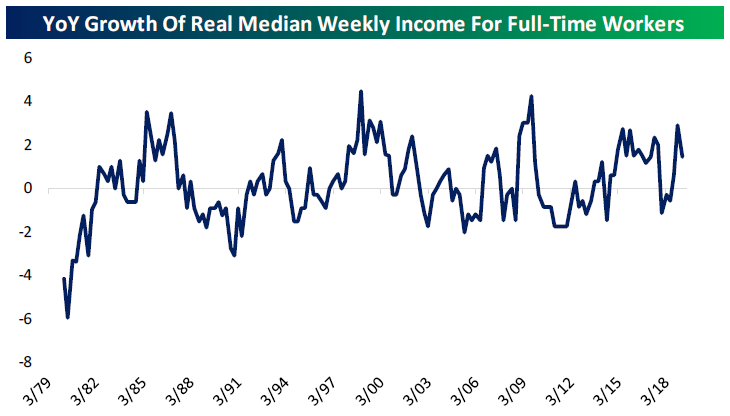 Yesterday the BLS released its quarterly estimate of median weekly income for Q1. After accounting for inflation, in Q1 the median worker with a full-time job took home the same income (seasonally adjusted) as in Q3 and Q4. 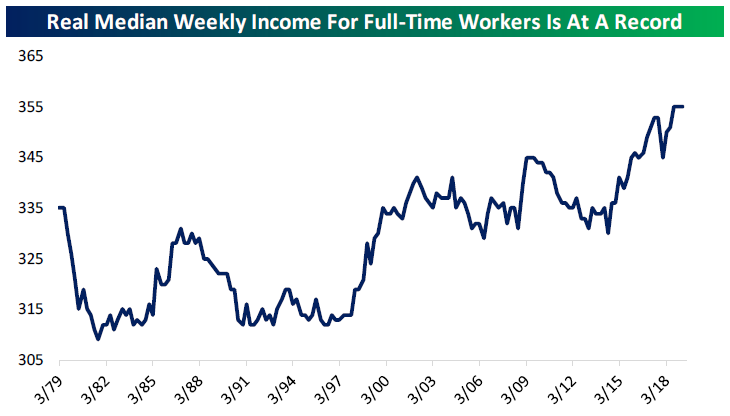 That’s the first time we’ve seen real weekly pay unchanged for three straight quarters in the history of the data set. While real income growth hasn’t been dramatic recently, there’s definitely been a trend of improvement since the end of 2014. As far as YoY growth goes, this series had its best year in a decade in the year ending Q4, but slowed YoY in Q1. At 1.4%, that growth is stronger than three-quarters of readings since 1979. In short, real incomes are growing at a healthy pace. 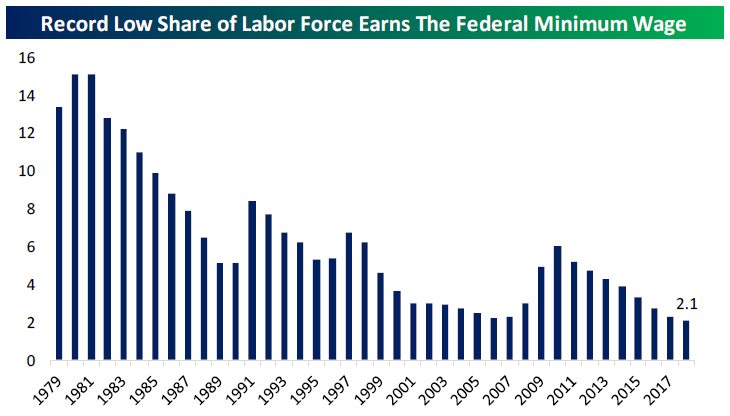 One other interesting data point released in the report is the share of workers nationally who earn the federal minimum wage. As shown in our last chart below, 2018 had only 2.1% of hourly paid workers receiving the minimum wage, the lowest percentage on record since 1979. The combination of state/local minimum wage hikes above the federal rate and a national legislative failure to keep the minimum wage rising with the pace of inflation are the key reasons for the decline to record lows. Start a two-week free trial to Bespoke Institutional to unlock the full Bespoke interactive research portal.